The purpose of this post is simple; to navigate through some of the different positions one could take regarding the ‘problem of free will‘. I’ve been asked by some to go over the basics, so, here it goes. I’ll define the major terms internal to the debate to give readers a bit more context and substance when thinking about future (and past) posts. Hopefully, this post will give those of you who are unfamiliar with the terminology related to the topic a better understanding of what’s going on. I’ll start by briefly pointing out what the ‘free will problem‘ is before moving on to the different positions one could take. What is the Problem of Free Will and why should we care? 1. “Free Will is the power of up-to-usness” (Saul Smilansky 2001; Joe Campbell 2010). Meaning, that the actions we perform are in fact up to us in a robust way. The details are important and can be cashed out differently but they boil down to a similar view. So, given your best interpretation of what free will is, why should we care? As Robert Kane has said “nothing can be more important than freedom to the modern age” (2005). But why? Well, when thinking about the concept of moral responsibility it becomes more salient. Free Will is intimately connected to concepts like responsibility, blame, praise, ‘just’ punishment, and the like (some argue that free will is central to notions of moral obligation, see Haji 2012 for more on this). It might be best to consider an example: Billy had a device implanted in his head over night. This device produces thoughts and ideas that lead to action. Justin is in control of this device, not Billy. Billy can’t even have a thought without it being controlled by Justin. Now imagine Justin implanting Billy with the thoughts to kill someone, and, erasing the thoughts to do otherwise via the device. When Billy kills someone should we blame him for it? Is Billy at fault or is Justin? Hopefully this example is starting to get you to understand the importance of free will. We normally assume that one has it. It underlies most of the above mentioned concepts. This is why we would blame Justin and not Billy in this example. Billy couldn’t have done otherwise, if he could have then we still might be inclined to blame him or hold him morally responsible, further, assume Billy is actually a nice guy, a guy who helped others all the time prior to Justin inserting the device in his brain. We assume that Justin wasn’t forced or determined to implant the device in the first place and that’s why we have no problem blaming him for doing it. If this is true, then it seems that the concept of free will is important to our practices of blame, praise, and to ascriptions of moral responsibility. I should note here that all of these assumptions are contentious, I only bring them up to show why some find free will to be a concept worth discussing. So, why shouldn’t we think that Justin in the example or anyone for that matter does not have the sort of free will required for blaming, praising, and holding one morally responsible? There are a number of reasons, but, determinism seem to be the biggest threat (one of them anyway), or so many involved in the debate would claim. After all, if Justin isn’t to blame does this make him a puppet or someone going for “the ride” so to speak? 1. If determinism is true, then no one has free will. 2. If indeterminism is true, then no one has free will. 3. Therefore, no one has free will. Determinism (for more click here) is the claim that past events together with the laws of nature bring about all future events. In other words, all action is determined to go one specific way, there are no choices in acting other than the way one will act. Given the laws of nature and your past you can only act one way or make only one decision. Some say this isn’t a threat to free will because they think that the concept of free will is compatible with the thesis of determinism, these people are called Compatiblists. Compatibilism (for more click here) is the claim that the theses of determinism and free will are compatible with each other (Mele, Campbell, Mckenna). There are different versions of compatibilism. For instance, J.M Fischer holds the doctrine of semi-compatibilism. Determinism is compatible with moral responsibility but not with regulative control which is required for free will. Incompatibilism, (for more click here) on the other hand, is the theory that says; since there are no robust alternatives to any action you partake in (assuming the truth of determinism), and since alternatives are required to have free will (see definitions above), then the thesis of determinism is not compatible with free will, hence incompatibilism. This is an intuitive view, especially for those who are just coming into the debate (see Haji 2009 for more on why this might be). Libertarians claim that incompatibilism is true but that we have free will (Kane, Clarke, Balaguer). 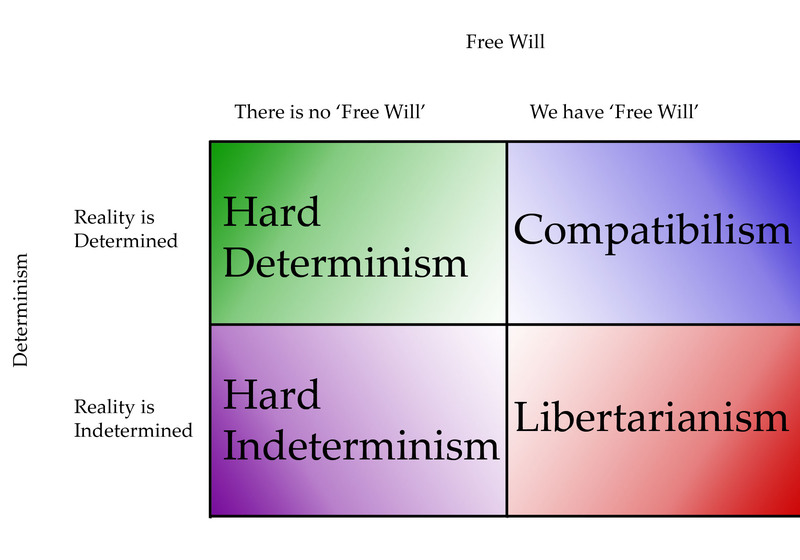 Free Will skeptics claim (Pereboom, Strawson) that incompatibilism is true but that we don’t have free will. Beyond these traditional approaches to the problem there is also the naturalist response and the revisionist response. Naturalism is the claim that humans do not have contra-causal free will. They are Free Will skeptics, but a particular kind of free will skeptic. They only disavow the sort of free will espoused by dualists and those that think humans can transcend causal laws and explanations in their behavior. Click here for more on their position. Revisionism (see Vargas 2007) is the claim that “what we ought to believe about free will and moral responsibility is different from what we normally think about these things”. In other words, revisionists claim that we are misguided by our initial intuitive ideas about free will and the revisionist aims to fix this. Some have argued that this is another form of compatibilism, I’d encourage you to read Vargas’ chapter and see for yourself. I’ve given a very brief run-down of the problem of free will and have given some of the ways that philosophers have responded to the problem. Admittedly, I have not flushed out the details of any of these positions, that was not my goal (that’s a book length project). Neither have I argued for any particular position being more salient than any other (that will come later). However, I hope that this post at least illuminated some of the ways one could approach answering the problem of free will and why we should care about trying to do so in the first place. Thank you for this great introduction and I definitely look forward to your more in-depth discussion of each of these. I am interested to know your thoughts on free will. Thanks, Jeremy. I’m glad you got something out of it. I have a few other posts on here detailing some problems with the neuroscientific research that claims to prove that free will is an illusion. I’ll be posting more about the specific arguments for and against us having free will in the coming months (I’ll weigh in as well). Wow! Wonderful Justin. Thank you very mcuh for introducing the ‘free will problem’ to us. A brilliant piece of illumination, Justin. I found the Power to begin to respond. I was happy with the outcome. Need I go on? If I have the Power, should I use it to go on? I’m not sure. I presume that Free Will comes with the Power to not use the Power! Thanks. Now if only I posted this prior to writing the 3 previous posts. Better late than never, I suppose. Justin. Before I go back and read your previous posts on Free Will, I’d really love to make sure I have a handle on the different positions you’ve highlighted in this post. Perhaps the best place to start is with a question about determinism/causal determinism. What are the ‘given’ laws of nature? Does Joe Campbell argue in his book ‘Free Will’ that there is no law of free will among the laws of nature? I propose that your example of Billy and Justin demonstrates that there is a natural law of free will, since it would not be necessary for Justin to artificially disable Billy’s free will with an implant if Billy didn’t have free will in the first place. To your question regarding Joe; Once you’ve understood what it means to be a law you’ll understand why Campbell doesn’t argue for free will as a law. 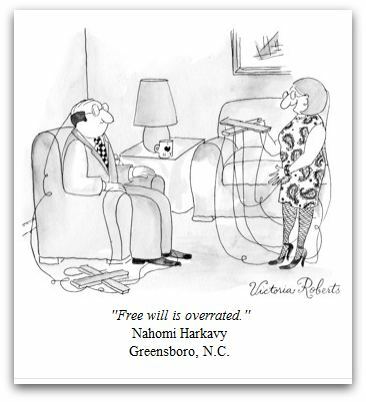 Free Will is more like a power or a capacity, but again, as you’ve seen above, the definition of free will is contentious which causes most of the problems within the debate, though not all of the problems central to the debate are merely verbal. With regards to the Billy/Justin example; interesting point. However, I don’t think it flies. Billy having thoughts to do x (x could be anything other than what my implant has advised him to do) does not mean that Billy has free will_necessarily_. All it implies is that Billy has thoughts. Those thoughts could be causally determined (or so hard determinists will argue). Justin implanting one thought doesn’t preclude Billy having other thoughts. The point of the example was to show that if someone was controlling which thoughts you acted on would you see the actor as morally responsible for the action or would you see the manipulator as morally responsible for the action. And, by analogy, hard determinists/free will skeptics argue that examples like this show that we can’t be morally responsible for anything because we live in a causally determined Universe and we are physical entities within that causal structure, bound by the same laws and the past. With that said, I’m not convinced that we do not have free will, but, the more I read the more I am warming up to the fundamental incompatibilist intuition that’s driving the above mentioned conclusion. Hypothetically, I wonder if free will would be considered a law of nature if it turned out that there were unavoidable and predictable consequences in violating it as a principle. For example, if agents X and Y are such that they have the power of free will, then the Law of Free Will determines that agent X preventing agent Y from exercising the power of free will results in event Z happening. One might imagine some (single-lifetime) karma-like system where event Z is some apparently coincidental but actually law-driven piece of bad luck that happens to agent X who violated the law. I hasten to add that there’s not a shred of evidence that such a law exists, but might it serve as an example of both naturalizing free will and a truly objective moral system? If so it would illustrate that such things are not beyond the realms of possibility. “You can give me one spot. The Phi Effect is an interesting read! This paper of his is even more in depth and delves into other areas and implications. I’ll give it a read, Jay. Thanks for the reference! Thanks. I have come across this but thanks for keeping me in mind Sreejith! Nicely put together. I just thought that I would also mention that there is quite a fascinating discussion taking place in (part of) the quantum physics community. You can check out the arxive (http://lanl.arxiv.org) and search “Free will”. Ignore anything to that mentions quantum and consciousness at the same time. Always. Anything there referring to Bell inequalities would be worth a read and I don’t think that much quantum physics is necessary. Good fodder for a philosopher. Justin, I wonder whether you have incorporated or considered the relevance of evolutionary sciences and behavioural sciences in the “problem of free will”. Thank you for this excellent summary or cartography of the issues and debates. I have considered the relevance of the behavioral sciences. Currently, I’m working on the intersection between Neuroscience, Psychology, and Philosophy. I think that the more we understand about how the mind works the closer we will get to answering the central questions in the free will debate. I haven’t considered evolutionary biology and the relation to free will… I’m currently sitting in on a Philosophy of Biology Grad Seminar and might delve into writing on that topic before the end of the semester. That’s great! Auditing other undergraduate and postgraduate courses is an interactive way to touch base with researches from other fields. I am taking my hat of for you in your willingness to approach philosophical inquiries via multidisplinarity. I’m sure I have tons of typos in most of what is written in this blog so no worries. I think philosophers should be empirically informed by the sciences most relevant to their work (in my humble opinion). I also think that scientists should have at least SOME philosophical training before assuming narrow interpretations of the data they are compiling. Often, I have found that there are feasible (sometimes equally compelling, or even more compelling) interpretations of the data other than the interpretations presented by leading cognitive scientists as well as social psychologists. Philosophers and Scientists alike need to collaborate to draw accurate and responsible interpretations and conclusions. I agree with you. The impacts of science and its many problems could have been considerably reduced if not eliminated if more scientists are much better informed by the philosophy of science, the history of science, and the sociology of science. There are also the interplay and confluence between art and science. Justin, this is an excellent post, especially considering the implications that the freewill debate will have in our society like, for example, punishing criminals. I have actually written a post on this: http://nickandrea19.wordpress.com/2012/11/09/we-have-freewill-dont-we/ I’d be curious to have your thoughts on it. A willed action is preceeded by thought. If we act, what we have thought of, it will be called an action of free will, if not, it will be a thoughtless action ( instinctive). Do we have a freedom to choose thoughts ? Not always. Here is an experiment. Close your eyes and make a resolution to yourself that only a particular thought will be in my mind, no other thought will enter my mind. This is impossible. Some stray thought will definitely strike you. So although we have freedom to act, we do not have, always, freedom to choose thought. Does it prove that we have no free will ? You have some great material here. As to the subject of this particular article, i’m going to assume is that I am not unusual in having spent quite a bit of time considering the issue. Bottom line…there is no free will. one may have volition, the appearance of making a choice, but, as I have written in various articles, the only possible way one might have free will is to have created oneself out of whole cloth, and even under those circumstances I might argue against it. The reason for this is that there are two choices. 1. You make decisions in a vacuum in which case they aren’t really decisions. 2. You make decisions based on who you are is not something which you created. Thank you for sending me back here. I took the time to click on Naturalism and found that there are indeed a few other individuals out there that get it. I can’t say that I am completely aware of all the in’s and out’s of the philosophy, but barring some illogical conclusions on how the philosophy negates such concepts as responsibility and assignation of blame, I may have finally found a home. Next, I will take advantage of your absence to write another comment……. Your Billy/Justin example ignores a very important relevant factor which is why you may still be equating the absence of free will with the absence of volition. In other words, you are claiming to use one definition of free will while actually attempting to prove the existence of another….using the definition that I claim as being the most accurate. As I believe I have mentioned before, this propensity to argue against “my” definition of free will while continuing to discuss the concept in such a way as to make it clear that it is the mutually agreed upon definition is so common as to be ubiquitous. The point being that in your example you once again equate the absence of free will with the absence of volition and yet might be tempted to respond to that assertion by once again claiming that a number of definitions exist. Not true. The whole point of the example is to show that Billy has no free will, as I define it, and thus is not responsible for his actions. Billy, in your example, has neither volition nor free will not because of the fact he is unable to make any choices of his own, but because he can make no decisions of his own in response to his environment. Let’s assume that he has the same device in his brain and that this device was implanted by Justin thus he has no “free will”, per my definition. The question of whether he can and should be held responsible for his actions rests on whether he has the capacity to be influenced in any significant way by the environment in which he find himself. This is the very same question which, for example, the legal system asks in attempting to determine culpability. If someone is not influenced by his environment, and only acts in accord with his genetic predispositions, we call him “crazy” and as a result we may commit him to a mental institution we recognize that he simply cannot “help himself”. This would be the predicted response to Billy under the terms of the example you provided in the article. On the other hand, using the same scenario but with one minor revision the response would be quite different. Assuming the implant allowed Justin to control Billy’s actions, but that Billy was able to understand the relationship between his actions and the consequences which might predictably occur as a result of those actions, the question becomes to what degree the positive and negative consequences of any specific action affected the choices he made. If reward and punishment have any significant influence on his behavior than we consider him to have “free will” and hold him responsible for his actions. He evidences his ability to make blameworthy choices by understanding the consequences. He does not evidence free will by making choices by metaphorically flipping a coin whenever a decision must be made. And, yes, the comment might also have been shorter and clearer, but I believe it essentially makes the proper argument. It seems to me that in the Billy/Justin example Justin is the anthropomorphized equivalent of DNA and environment: they too allow of no other thought or action but what actually occurs. All legal systems I’ve heard of have at best an ambiguous view of freedom of action. There may be a recognition of “mitigating factors” when assessing moral responsibility, but all too often the unhelpful question “Did he know what he was doing?” is asked. Serious philosophy and the laws of physics don’t get much of a look-in in the courtroom. @Justin: Excellent and a very important topics. Free will (if there is) is by all means an emergent faculty. Thus, the recent discussion on ‘emergence’ at Scientia Salon could be something useful for this free-will discussion. I wrote two comments on ‘emergence’ there (see http://scientiasalon.wordpress.com/2015/01/05/apa-2014-4-emergence-and-complex-systems/comment-page-1/#comment-10709 and http://scientiasalon.wordpress.com/2015/01/05/apa-2014-4-emergence-and-complex-systems/comment-page-1/#comment-10718 ).